Blood clot. 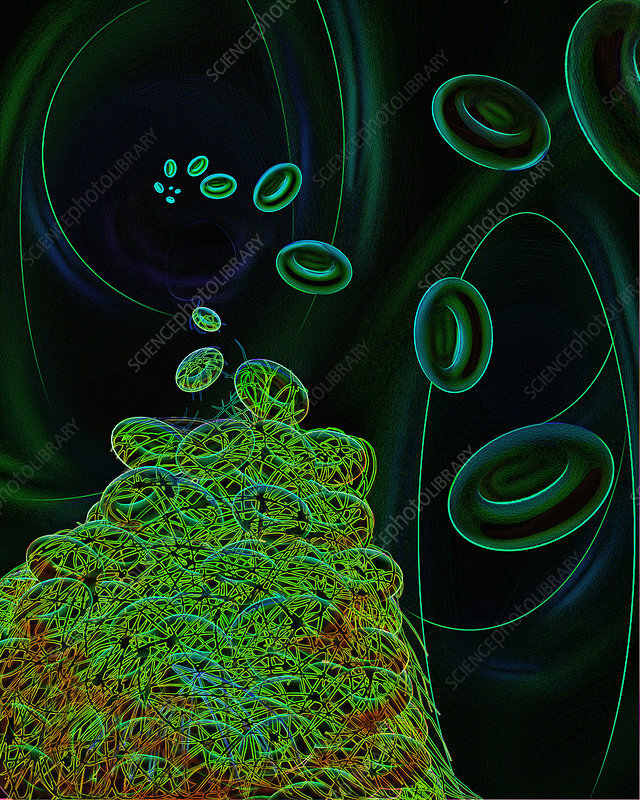 Computer artwork of a blood clot, showing disc-like red blood cells (dark green here) and fibrin. Fibrin (yellow, green & orange fibres) is a long insoluble protein produced from the blood protein fibrinogen. Platelets in the blood (not shown) release chemicals which effect this conversion when they come across an injury in the vessel wall. The tangles of fibrin fibres trap red blood cells and this causes the clot (thrombus), which covers and protects the injury. Clots can also form inside blood vessels when there is an abnormal tendency of the blood to clot (thrombosis). This can cause strokes and heart attacks.